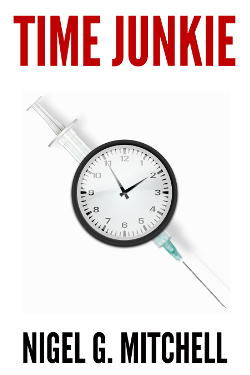 My next novel is coming out on October 16, 2015, entitled Time Junkie. Here's the description. "My name is Timothy McGill, and I'm a time travel addict." In a near future, a teenage boy stumbles across krono, a new drug which sends you back in time while you trip out. From the moment he first tries it, Timothy begins a downward spiral into crime and corruption, all while living through the moments that led to his addiction. While it deals with a teenager, I'm not sure yet if it would qualify as a young adult novel. There's no profanity or sexual situations, but it gets pretty intense with scenes of addiction, domestic abuse, and criminal activities. Then again, The Hunger Games is young adult and has scenes of children being slaughtered in gruesome ways, so maybe the genre is broad enough for it. I dunno. To get personal for a moment, I have to say this was a real departure for me. I usually write comedy and thrillers, but this is more dramatic and character-driven than I usually do. It forced me to stretch as an author. I found it a really challenging novel to write, and I hope I succeeded. On October 16, Time Junkie will be $2.99, but you can pre-order it now for only 99-cents. You can also read the first six chapters free on Wattpad.